5 Patriotic Foods For an Unforgettable Election Year! We’ve compiled some of the most amazingly patriotic dishes that might as well have their own bald eagle sound effect when being served. 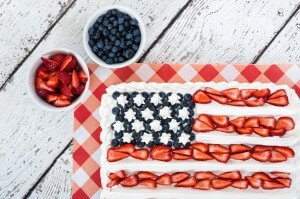 Take your celebrations to the next level with these awesomely patriotic red, white and blue foods! Place potatoes into a pot and cover with salted water; bring to a boil. Reduce heat to medium-low and simmer until tender, about 20 minutes. Drain and slice potatoes into 1/4-inch rounds. Preheat oven to 400 degrees F (200 degrees C). Spray a large baking sheet with cooking spray. Unroll the refrigerated pizza crust and spread it out in the baking sheet to fit to the edges. Brush the crust with about 1 tablespoon olive oil. Bake in the preheated oven until lightly golden and slightly set, about 7 minutes. Arrange pepperoni slices on a paper towel-lined, microwave-safe plate. Microwave pepperoni on high until heated through, about 30 seconds. Spread Alfredo sauce over the baked crust; top with Italian cheese blend. Arrange potato rounds in the top left corner of the pizza, forming the blue portion of the flag. Brush potatoes with remaining olive oil. Place mozzarella ball halves on top of the potatoes to resemble the stars of the flag. Arrange pepperoni slices, slightly overlapping, in rows across the pizza to resemble the stripes on the flag. Bake pizza in the oven until the crust is golden brown and cheese is melted, about 10 minutes. Wrap the breadstick dough around individual hot dogs. Skewer the finished hot dog and add a triangle of cheese on top. Place cream cheese between two sheets of waxed paper. Roll out to 6×4-inch rectangle with rolling pin. Remove top sheet of waxed paper; coat top and sides of cream cheese with shredded cheese. Invert onto serving plate. Remove waxed paper. Arrange three rows of olives in top left corner of cream cheese rectangle for the “stars” of the “flag.” Make four 1/4-inch-deep rows, using rounded end of 1/4-tsp. measuring spoon for the “flag’s stripes,” leaving a 1/4-inch-wide space between the rows. Fill rows with salsa. Serve immediately or cover and refrigerate until ready to serve. Add boiling water to gelatin mix in large bowl; stir 2 min. until completely dissolved. Stir in cold water. Pour into 9 parfait or dessert glasses. Pour in a glass, add a straw and drink up! Now everything from you main course to your drinks can be USA themed this year! You can find all of these ingredients and more at your local Reams Food Stores. Enjoy yourself and have an amazing summer!